What Are The Best Online Associate in Multimedia Design Programs? What Else can I Expect from an Online Associate in Multimedia Design Program? What Can I Do With an Associate in Multimedia Design Degree? In a world that increasingly relies on technology, an online associate degree in multimedia design provides a practical foundation in visual communication skills. From digital photography to web design, this multidisciplinary degree will prepare you to use multimedia tools in a variety of professional settings. The Bureau of Labor Statistics (BLS) projects that careers in multimedia art and animation will grow by 10% between 2014 and 2014, which is faster than the national average for general job growth. Consequently, a multimedia design degree can help you become a highly marketable professional in the world of visual communication. The Idaho branch of the famous Mormon-affiliated school houses many of the BYU system's best distance learning programs. One of these programs is the university's online associate degree in web design and development, which covers the study of graphic design, information design, interaction design, and typography. Students can choose an emphasis in design or development, and must complete a total of 60 credits over the course of two years. BYUI's online associate degree in multimedia design incorporates asynchronous and synchronous formats and allows for plenty of faculty interaction. In order to take online courses at BYUI, students must complete either 15 credits at a BYU-affiliated school or complete the school's proprietary PathwayConnect orientation course. Students with previous BYU credits must have earned a GPA of at least 2.0, while PathwayConnect students must have earned a minimum GPA of 3.0. Located in the Hudson Valley in Troy, New York, HVCC trains web designers nationwide through its online associate of applied science in computer information systems. The program includes a specialization in web design and programming. Students can take courses in database management systems, business analytics with Excel, and information systems analysis and design. Because of its asynchronous coursework, HVCC's online associate degree is flexible and has no in-person requirements. The program is also affordable, as all online students are able to pay New York resident tuition. Depending on the electives they choose, students who complete the associate degree can find work as system analysts, application programmers, and web designers. Students can apply in the fall or spring terms. In addition to serving communities in and around Mohave County in Arizona, MCC reaches distance learners nationwide through its associate in applied science degree in computer graphics and web design. Students at Mohave must complete between 60 and 65 credits to earn this multimedia design degree, which usually takes students about two years to complete. Coursework in the program blends the study of business and computer information systems with a general education core. Upon graduating, students are well-prepared to work as web and graphic designers, or to transfer to a four-year university to earn a bachelor's degree. There is no minimum GPA requirement for admission, but all incoming MCC students must complete placement tests to ensure they get the most out of their coursework. The school maintains transfer agreements with most Arizona state schools, including a particularly strong connection with Northern Arizona University. Located in Carson City just east of the California border, Western Nevada College is a regional school that offers nationally acclaimed distance education programs. One such program is the associate in applied science degree in graphic communications, which is an excellent option for students looking to enter the field of web and graphic design. Students in the multimedia degree program must complete at least 60 credits, which most WNC students accomplish in about two years. The curriculum includes courses in drawing, web design, and web animation along with electives in printmaking, ceramics, sculpture, and painting. Any student with a high school diploma or GED, six college credits, or placement test scores that demonstrate college readiness gains automatic acceptance to WNC. The school accepts almost all transfer credits earned at regionally accredited universities, and students may complete up to 75% of the credits required for a degree outside the college. To graduate, students must also complete a course in the U.S. and Nevada constitutions. Based just outside of Seattle in Kirkland, LW Tech focuses primarily on career education. Because of this commitment, the school's associate degree in digital design prepares its graduates for entry-level positions in web design, mobile content design, and digital publishing. Intended as a transfer curriculum for students who plan to enroll in four-year schools, the program introduces students to drawing, digital photography, motion graphics, and digital publishing. Students who earn their multimedia design degree at LW Tech must complete a total of 100 quarter hours. The typical LW Tech multimedia design student finishes in six quarters, or about two years. While out-of-state online students are not eligible for in-state tuition, LW Tech's per-credit tuition rate is remarkably affordable. Transfer students and first-time applicants receive assistance from coaches to help guide them through the admissions process. The specifics of your online associate degree in multimedia design will vary depending on the program and school that you choose. In general, this degree introduces students to skills for entry-level jobs in graphic and web design, animation, video game design, commercial art, advertising and marketing, and film. The exact courses in your program will depend on the school you choose. However, most programs in this field cover core skillsets such as web design and computer graphics. Below is a list of sample courses for a multimedia communications degree. Marketing Research Multimedia: This course teaches students how to integrate the fields of design, marketing, and business by utilizing multimedia tools. Students learn research strategies, marketing concepts, and strategies for analyzing data. The course prepares students for entry-level jobs in graphic design, multimedia marketing, and other areas related to business. 2D Graphics: Focusing on color and composition, this class typically introduces students to graphic design concepts such as vector-based and raster-based graphics, figure and ground relationships, and spatial illusion. Classes in 2D graphics can prepare students for careers as independent artists or graphic designers for businesses. Business for Creatives: This class introduces students to the world of commercial art and business and prepares them for positions as freelance commercial artists and private contractors. The course covers basic skills in client management, taxes, employee management, licenses, and self-promotion. Often, this class features visits from professional multimedia contractors. How Long Does it Take to get an Online Associate in Multimedia Design? In general, it takes about two years to complete an online associate in multimedia design that consists of 60 to 90 credits. Several factors can affect how long it takes to earn your online associate degree in multimedia design. Programs that rely on cohort learning, in which students progress through the program at the same time as a group of peers, may take more time than individually paced programs, which allow you to complete classes and assignments at your own pace. In addition to the program's structure, your personal situation, such as whether or not you are working while earning your degree, will also affect the program length. Several programs offer full-time or part-time schedules and several other flexible options to help you balance coursework with other responsibilities. Many employers and universities do not accept degrees or credits from nonaccredited schools. As such, it is critical that you make sure your online associate in multimedia design is offered through an accredited institution. The accreditation process requires an institution to evaluate its faculty, its programs, and its students' academic performances to determine whether or not the school meets certain educational standards. Nationally accredited schools are often religiously affiliated or profit oriented. National accreditation is also commonly given to vocational and technical schools. Regionally accredited schools are usually nonprofit and degree oriented; this type of accreditation typically involves a more rigorous process and is more widely respected. 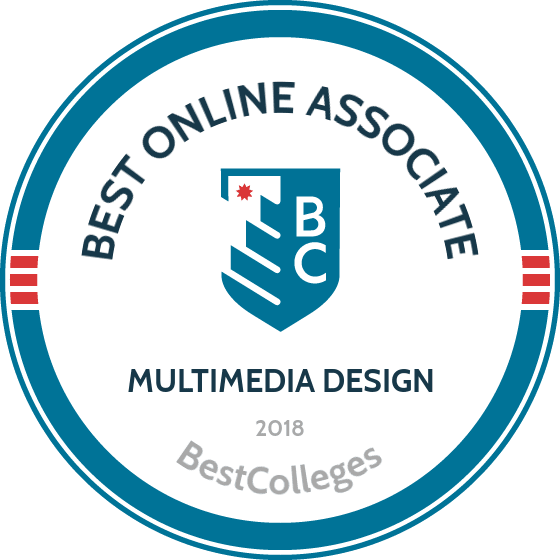 Look for regionally accredited schools when choosing your online associate in multimedia design. Many schools in multimedia design also receive additional accreditation from the National Association of Schools of Art and Design (NASAD), which establishes standards for undergraduate and graduate programs in design and communications-related fields. An associate in multimedia design provides students with the skills necessary for entry-level jobs. This degree is also a good choice for professionals who would like to expand their skills to advance their careers. However, many students go on to earn their bachelor's degree in multimedia design or a related field. Individuals with bachelor's degrees typically earn higher-paying jobs than those with associate degrees. According to PayScale, those who have an associate degree without a bachelor's degree typically earn about 20% less than those with a bachelor's degree. Bachelor of Arts in Multimedia Design: This degree integrates visual arts with information science and technology, communications, and business. Individuals who earn a BA in multimedia design often work as web developers, art directors, advertising managers, or media relations specialists. Bachelor of Fine Arts in Digital Art and Animation: Students who earn their BFA degrees in this field are prepared to work as visual artists in a variety of professional studio environments. This degree provides students with strong skills in animation software, game and web design, and other areas of art and technology. Bachelor of Science in Media Communications: A BS in media communications prepares students to work in the evolving world of technology, business, and public relations. Graduates often work as copywriters, creative directors, advertising specialists, and media consultants and planners. Because multimedia design combines so many different skillsets, a degree in this field prepares students to work in several different industries. Graduates can work as art directors, multimedia artists and animators, graphic designers, film and video editors, digital photographers, and public relations specialists. Additionally, according to the BLS, nearly 60% of multimedia artists and animators are self-employed. A multimedia degree is a good option for individuals who are both creative and pragmatic, who work well under deadlines, and who are interested in a variety of artistic and communications-related media. Below are possible career paths for those with an online associate degree in multimedia design. These professionals create images and layouts for advertisements, brochures, magazines, reports, websites, and other forms of media. The job usually involves using design software to communicate ideas in nearly any industry. About one in five graphic designers are self-employed. Public relations specialists are responsible for managing the public image of the organization that they represent. These professionals often work with social media to raise awareness of an organization's identity and to help their clients communicate effectively with the public. Multimedia artists and animators produce animation and other visual images for film, television, video games, advertisement, and other entertainment media. They can work in a team or as a private contractor to research, develop, and edit animated visual art. Web developers create websites for various companies and organizations. They are responsible for both the website's overall appearance and the technical aspects of ensuring the website runs smoothly. Web developers should possess skills in graphic design and programming. Film editors work in studios or offices to create the final products for movies, television shows, commercials, music videos, or news and sports. These professionals typically need a bachelor's degree in film, broadcasting, or a related field. Because multimedia design is a multidisciplinary field, the career paths and salaries vary widely. An associate degree in multimedia design prepares individuals for several entry-level positions, but most professionals eventually earn a bachelor's degree or higher in order to increase their earning potential. The following table features data from PayScale regarding the salaries for five different careers in this field. There are several ways to fund your multimedia degree. Most universities offer scholarships, grants, fellowships, loans, and work-study opportunities, and many local organizations alo offer funding opportunities. Additionally, multimedia students can often access special funding, such as scholarships from Worldstudio AIGA and the Print and Graphics Scholarship Foundation. To better understand the financial resources available to you as a student, be sure to fill out a FAFSA.